The entire look was done using extremely affordable products. I'm featuring some of my favorite products today. The images on the site aren't often accurate so I swatched them above for viewing. 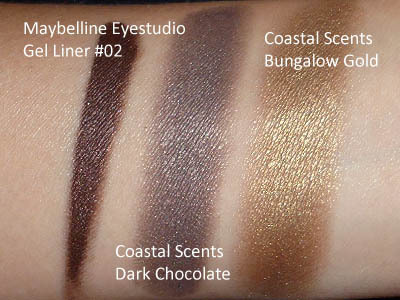 I also used Maybelline's Gel Liner in 02, which is a shimmery chocolate. Step 1: Begin by first using a flat angled brush to line the upper lash line from outside in using a deep taupe shadow, angling diagonally downward so there is a slight wing. 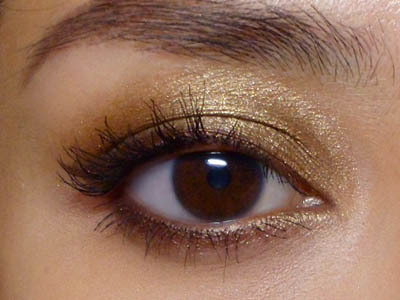 Run in along the outer half of the lower lash line as well. 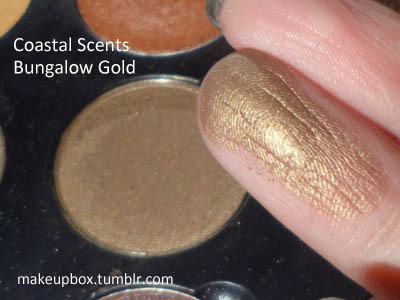 Step 2: Use a soft blending brush to buff a rich bronze shadow over the entire lid. Blend up beyond the socket line. 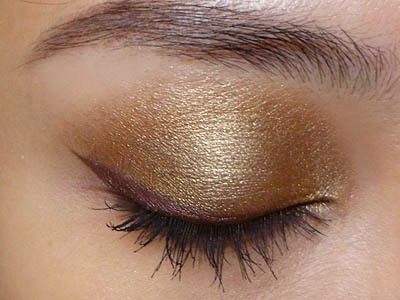 Then use the angled brush to run the bronze shade all along the lower lash line as well. Step 3: Now for the liner. Since you've already laid down an angled line earlier using the dark brown shadow, it should be a piece of cake going over it with the brown gel liner now. This should give you a very neat but not-too-harsh line. Step 4: Finish by curling your lashes and applying black mascara. I'm using Maybelline Great Lash Black. Any black mascara you like will do. Yes! And I can't believe I we get one of those fab brushes with every pot! I use one as a concealer brush haha!